Contractor errors often switch state and US routes, but rarely mess up on Interstates. This is the only US-I swap I know of (there was the reverse case in Washington D.C., where I-50 mysteriously made an appearance), courtesy Doug Kerr. I-278 is a horrid excuse for an Interstate, patched onto a network of existing highways including the Staten Island, Gowanus, BQE (Brooklyn-Queens), and Bruckner Expressways... and the Grand Central PARKWAY. 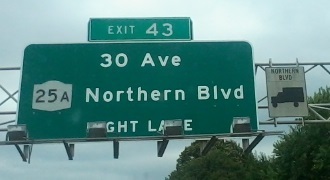 This means that trucks have to use Astoria Boulevard, because trucks are not allowed on parkways. 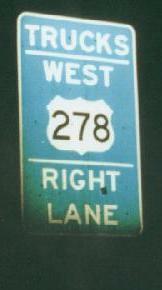 Also, I-278 goes to one lane more than once, such as when exiting between the BQE and the GCP. The BQE SB, but not I-278 WB. 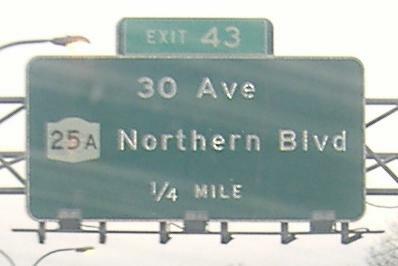 This is a spur from the Grand Central Parkway WB in a long wye interchange, so long there are intermediate exits.